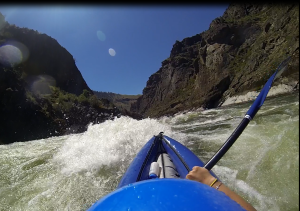 We float the Salmon River, the Snake River in Hells Canyon and the Owyhee River. This past weekend we floated the Salmon River with a great group of people. The night before we put our boats on the water, the air was very chilly- not really what you’d expect at the end of June. But, looking at the forecast, we knew Mr. Sun was working up to a big weekend. The temperatures were predicted to be in the high 90’s low 100’s. When the mercury peaks that high, there’s one place that we like to be- on the river! As we rigged our boats, the sun beat down on us, it was quite a contrast from before, but thankfully we had the refreshing water of the Salmon River right in front of us, and cooling off was just a short dip or quick wade away. Once the boats were ready and everyone was loaded into them we set off on a memorable Salmon River Whitewater Rafting trip. There are four canyons on this section of the Lower Salmon River- Green Canyon, Blue Canyon, Show Canyon and Cougar Canyon. All these steep canyons offer amazing solitude rarely seen in this day and age with no road access or trails your only option is by boat.We float Green Canyon on our one day trips, and in order to experience the other two canyons, we recommend planning at least a 4 day, though ideally 5 day trip. 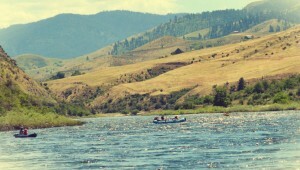 The river corridors in Idaho are rich with history, and the Salmon River is no exception of that. Some of the most detailed and well preserved pictographs are located on the Salmon River. For most pictographs, there are a couple of figures, usually very simple in nature, but there is one pictograph on this river that has so much detail and design, you really have to stop and ponder what the meaning of it is. Taking a Salmon River Whitewater Trip is the best way to see the well preserved history, as the canyon walls are very steep, making it difficult to hike in. Along with great history, the Salmon River presents some great whitewater! There are many class II rapids with calm, fun waves, there are also a couple of class III and IV rapids that can really get your blood pumping, then there is one single class V rapid that can give you quite the thrill! This is a very elusive rapid, as it’s deemed un-runnable at certain high water flows, yet at low water flows it’s barely a ripple in the river! This past weekend the flow was right around 14,000 cubic feet/second so it was perfect! It wasn’t anything that was going to knock us out of the boats, and was just a long wave train of big roller coaster rapids. We scouted the rapid, The Slide, just to be safe and certain that we knew the safest run. *This is a shot taken with out Go Pro, entering Snow Hole Rapid. All in all it was a great trip, with great people. We enjoyed hot summer days, white sandy beaches to camp on, outstanding dutch oven cooking, enough whitewater to make anyone smile and just that general idea of being on “river time”.